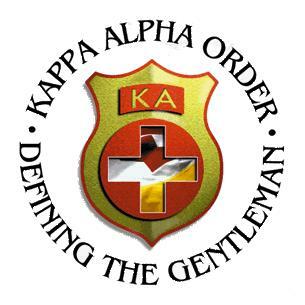 Kappa Alpha Order provides a way of life significant to the development of young men. Our founders sought to create an organization rooted in the highest ideals of the time. Those same traits of honor, chivalry, and gentility have remained timeless throughout the ages and are the core of Kappa Alpha. Emulating chivalric ideals and genteel ethics, KA translates these timeless philosophies into the mainstream of American colleges and universities. These gentlemanly traits are the hallmark for men who have chosen our unique lifestyle. The philosophy of the Order is that the acquisition of knowledge and the development of character are the great goals of life. Through fellowship and brotherhood, KA seeks to teach young men to be leaders; to be brave, self reliant, and to continually strive to better themselves.